Create text-only Tumblr posts, including WYSIWG formatting. Is there a better alternative to myTextPost? Is myTextPost really the best app in Internet Utilities category? Will myTextPost work good on macOS 10.13.4? myTextPost for Tumblr?! Yes, I know - some WP user will smile. But there are so many people out there, using Tumblr for much more than re-blogging annoying GIFs. Mind the New Yorker-Tumblr for example. And for us the Apps with 'pro' features for writing text posts - well, there is not a single one out there. Even my own myTumblr lacks some features serious blogger sometimes may need. Nor more FTP or Cloud App for images required! myTextPost needs a rating. Be the first to rate this app and get the discussion started! 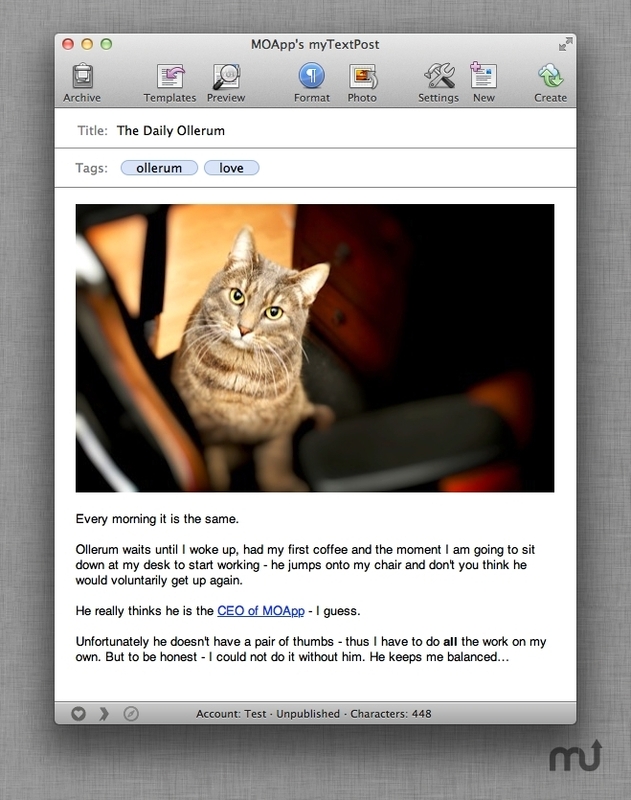 That's why I've written a completely new App for Mac for all out there, using Tumblr for writing awesome articles and entries. And nothing else - but text posts. It supports simple formatting like bold or italic, you can use HTML or even Markdown and open existing Text, HTML and Markdown Documents - thus you can even pre-write your articles with an App like myTexts pro. Unfortunately the Tumblr API does not allow to simply insert/upload photos into a text post for third party Apps - but don't worry. TextsPost supports CloudApp, FTP or simply insert a photo URL. Hopefully Tumblr will change this in the future. For the latest version I finally found a solution to insert/upload photos without using any own FTP server or Cloud App or whatever - just drag image onto the text and it will be automatically uploaded to the Tumblr servers and inserted into your text post. Of course you can preview the text you are working on at any time. Published posts can also be 'web-previewed' at any time without leaving the App and because blogging often means to work with web-finds, other articles etc. - I've extra added support for our Read It Later bookmarks with built-in preview. Because we often find a typo or have to re-write a paragraph the moment we've published a text - the text one is currently working on is automatically saved and even available after publication - so editing a published post is a piece of cake. And of course you can also access already published posts and because many of you really use the draft feature, they can also be accessed with ease.